Took advantage of the gorgeous weather this week to go out to the bee yard. Here in Maryland we have a very short, very intense honey flow from April 15th to May 15th, and that’s about it for the year. If honey is going to be made, it’s pretty much got to be made in that window. So I’m anxiously watching the colonies, crossing my fingers that we do get honey this year for the first time in several years. Colony 1 Lady Grey is just booming and looks utterly fantastic. I’m really glad I “checkerboarded” the brood frames (inserted new, undrawn frames between every two full brood frames) when I was in there back in late March. At the time I was just kicking myself (right after I did it we had a horrible cold snap and I was worried we’d lose all that brood that they couldn’t keep warm because they were too spaced out.) I wrapped the hives in insulation and crossed my fingers, and everything seems to be fine. These frames have already been fully drawn out and are starting to be filled, just like every other frame, so it is possible that I averted swarm pressure there. Colony 2 Darjeeling has a lot of drone… like frames and frames of it. My first thought when I saw that was “oh crap, a drone layer”... but then I found a few frames of worker brood as well, so that’s not it. Colony 3 Ceylon (last year’s swarm) keeps just barely put-putting along. They haven’t drawn out any more comb – they haven’t even finished drawing out the single deep they’ve been in since last July. I left the second box on top just in case they suddenly start booming, but I’m not betting on it. They’re not taking syrup and the queen seems to be barely laying. What she is laying is worker brood, in a good pattern, just not much of it. I asked a bee mentor about the second two colonies, wondering if I needed to replace the queens. Is the excessive drone brood a sign that the queen is getting old and running out of sperm? It certainly isn’t going to help to have all those extra mouths to feed instead of workers during the nectar flow. It takes 21 days for a bee to grow from an egg to a baby bee; another 21 days before it is ready to forage leave the hive and forage for nectar. So in order to have a worker ready to forage by April 15, its egg has to be laid by March 4th. I didn’t see nearly enough capped worker brood in there. Maybe they already emerged (March 25th?) and this drone comb is merely what replaced them. Why hasn’t the other queen kicked her laying into high gear yet? She’s already missed the critical window for laying workers in time to be ready to work during our very short nectar flow. There will be no surplus honey from this hive this year. My bee mentor says it’s still very early to decide to requeen. He advised that I wait another brood cycle (21 days) before checking again. I wonder if I should be using those 21 days to try and raise some queens of my own. I could take a frame of eggs and a frame of capped brood from the good colony. Sandwich it with 2 frames of honey/pollen and 1 of capped brood from the poor colony and put them in a little nuc. 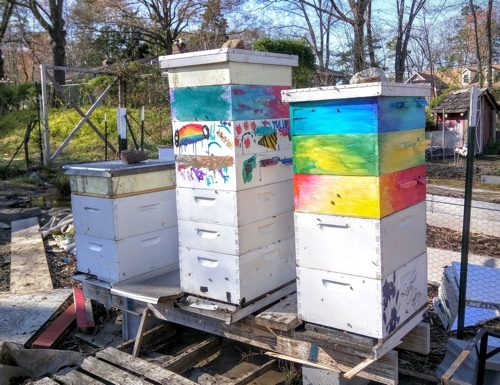 The nurse bees in the nuc would draw out the good eggs into a queen with better genetics, and once she started laying I would use that nuc to requeen the poor colony. I think I might try. In the mean time, the supers the girls and I painted sure do look cheerful up there. A few days later the bees still aren’t using the top entrances at all, but perhaps it will take time for them to change their habits. This entry was posted on Friday, April 22nd, 2016 at 9:10 am	and is filed under homesteading, bees, building. You can follow any responses to this entry through the RSS 2.0 feed. You can leave a response, or trackback from your own site. Atom, Entries (RSS .92), (RSS 2.0) and Comments (RSS 2.0). 26 queries. 0.515 seconds. Top.